These are sold to any organisation and as such, are considered to be in the public domain. Many can probably be found on the internet also. As such, they are not normally considered suitable for official examination by a Part-147 organisation or a Competent Authority. 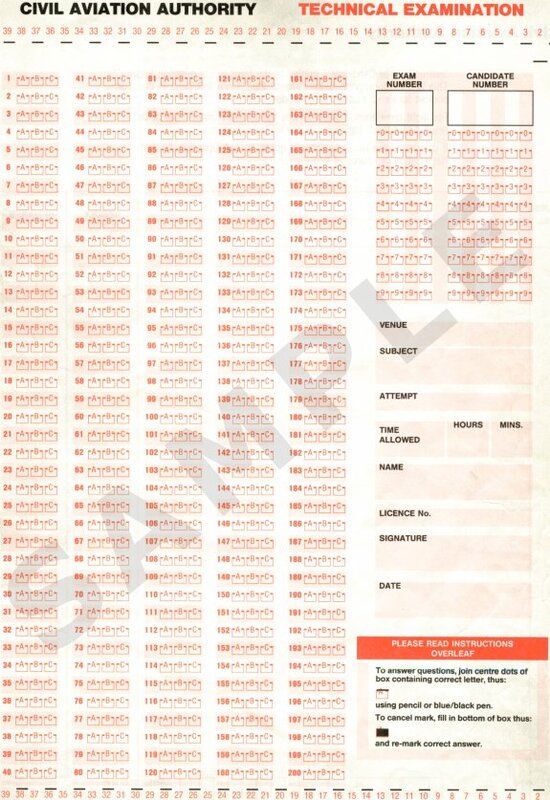 They are however very good for general "practice" of questions and phase exams etc. as a part of an ongoing learning process. We have over 22,000 Stock questions, covering all Modules (1-17) and all Licence Categories in accordance with the syllabus of EASA Part-66. You can choose how many questions you want to buy, per Module. You can also choose how many questions you would like per subsection, or, if you prefer, you can let us decide on the questions-per-subsection breakdown, based upon our experience of teaching the Modules, and the rule-of-thumb of approximately 1-question per hour of classroom training. Please note that these are not sold to individuals. If you are a student of the Part-66 Module subjects and are looking for a set of questions with which to test your knowledge prior to entering the Official Part-66 exam, please go to club66pro.com. Cost is £1 per question (plus VAT if applicable). What are Secure questions? These are sold only to Part-147 organisations or Competent Authorities. All questions are written by TTS and are kept out of the public domain. Any organisation wishing to buy these questions are required to sign a Non-Disclosure Confidentiality Agreement, to ensure they understand their responsibilities with regard to maintaining the security of the questions in accordance with Part-66/147 (or non-EASA equivalent) procedures. What is the cost per question? It is usual for organisations offering official examinations to hold 2 or 3 examination papers in each Module. You can choose how many questions you want to buy, per Module, or how many examination papers you would like. You can also choose how many questions you would like per subsection, or, if you prefer, you can let us decide on the questions-per-subsection breakdown, based upon our experience of teaching the Modules, and the rule-of-thumb of approximately 1-question per hour of classroom training. Cost is £2.50 per question (plus VAT if applicable) for the initial order. For 1x exam papers for all B1.1 and B2 (modules 1-10, 11A, 13, 14, 15, 17A), you will need 1,219 questions costing £3,047.50. For 2x exams, you will need 2,438 questions costing £6,095 and so on... Note: if a question can be used in more than one Module, for example where some Subsections of Module 11A is the same content and same Level (1,2 or 3) in Module 13, we charge only once for the question. What distribution (per Subsection) of questions do you recommend? Download below a spreadsheet showing the distribution of questions across Modules and Subsections. The spreadsheets will show you how many questions you will need to buy in total, taking into account which questions can be used commonly between Licence Categories. These are for 1x exam. Multiply the Grand Total by the number of exams you need (2x, 3x, 4x, etc.). The Questions per Subsection are our recommendations; you can change the quantities if you want but the Total per Module must be unchanged, as these are the minimums set by the EASA Part-66 syllabus. Delete also any modules you do not need (for example Modules 12 and/or 16). When you have decided and made your changes to suit your requirements, email the spreadsheet to us, and we will invoice you for the Grand Total cost and supply in due course. What if I need to add more questions later on? Most Comepetent Authorities require exam question databases be reviewed annually (sometimes bi-annually) and redundant questions withdrawn from use, and at least 10% new questions added. Subsequent orders are £3.00 per question (plus VAT if applicable). The additional cost is because of the additional work required to make sure that we do not deliver duplicated questions, or similar questions, as were delivered in your initial order. All questions in initial order are randomly selected from our database. For subsequent orders, the questions must be hand-picked carefully. Reference to module and Part-66 syllabus paragraph / subparagraph. Each Module is delivered as a seperate file of questions, headers are used to subdivide the questions into Subsections in accordance with the Part-66 syllabus. Note: The above sample questions are provided in two different formats, as examples. You can define your own format as required, when you purchase questions. These are sold only to Part-147 organisations or Competent Authorities. All questions are written by TTS and are kept out of the public domain. They are written "on-demand" and after we deliver, we destroy our copy. They are not sold to any other organisation. Due to the difficulty in writing such "unique" questions, they take a considerable amount of time (expect, for example, 3-month lead time for a set of 100 questions, depending upon our current workload). Cost is £12.00 per question (plus VAT if applicable). As above, we can supply Stock Essay Questions (£1.00 per questions) and Secure Essay Questions (£2.50 per question) and Unique Essay Questions (£6.00 per question). These do not include answers or marking schemes. If you would like answers/marking schemes, please add £50 per Stock Essay Question, £75 per Secure Essay Question and £750 per Unique Essay Question. 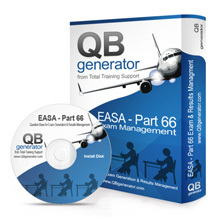 If you are looking for an exam management software, specifically developed for Part-66 syllabus and exams, where you can upload your own questions, edit questions, generate Part-66/147 compliant exam papers, deliver in paper format or on-screen (via secure Wi-Fi), store results and print Pass Certificates, then the QBgenerator is the solution for you. We install it for you (on any windows based PC/laptop, or your intranet server), and provide training on how to use it. Questions (of any of the above types) can be installed as part of the delivery. For more information, check out qbgenerator.com. Contact us to arrange a demo (either by visit or by Skype). For a short synopsis and video, click here.